All jokes aside, Gladion enters into the card game with a…really unique effect. When you play Gladion down, he lets you look at your Prizes and then put one into your hand while slipping Gladion into your Prizes in place of it. There’s also a strange little clause that says if you don’t play Gladion from your hand that it does nothing? I guess the main reason for that is to avoid using the effects of cards that would copy a Supporter like a Pokemon attack from triggering Gladion and forcing you to shuffle the Pokemon into the Prizes instead? It’s a weird clause, but I’m guessing it’s for those weird fringe cases that could crop up. In any event, Gladion’s effect to get a look at your Prizes on its own is already good for information – and unlike something like Town Map, he won’t tell your opponent about it either. But on top of that, he’s able to snag something in those Prizes that you’d need and puts himself in its place! That’s pretty good in case you end up roaming through your deck and find you don’t have what you need. And even better, your opponent won’t have a clue what you ended up putting into your hand, so it’s a pretty neat way of surprising your opponent! Does that mean Gladion’s a massive staple to be played in everything? Not really. He’s a good one-of to try and get what you need – maybe 2, if you wanna see him more often and not end up having to draw him out of your Prizes. It’s also important to keep in mind that you’re going to have a significantly smaller pool of cards to look through for what you want. He is no substitute for something that searches through your deck – he’s really only there to grab something that you can’t find in your deck. Probably because it got Prized. It gives him some unique utility as a means of snatching up Prize cards, and there’s really only one reason you wanna play him – which is to find out what your Prizes are. And since he shuffles up the Prize cards, technically you shouldn’t have the ability to immediately draw what you want, in which case there’s still a random chance of drawing Gladion as well, so you can use him again on your next turn. Like I said, he’s got unique utility, and he can do something no other card in the game can do right now. He’s definitely worth a shot at least! 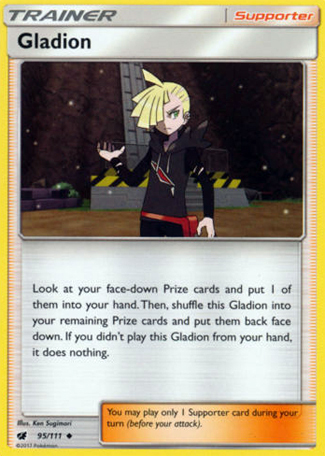 Arora Notealus: Keep in mind that Gladion needs to grab a Prize card – you can’t just look and decide that you don’t want any of the cards in your Prizes when you use him. Besides, it’s not like there won’t be something you don’t want. Even if it’s a basic Energy card, that’s still something! And you’ll always have the information of knowing what’s not available in your deck ready and waiting for you on the side. Remember kids, knowledge is power, and power is something stored in your hand that you’ve got to control! …seriously though, why are you grabbing your hand, Gladion? Gladion (Crimson Invasion, 95/111) makes its debut in the Pokemon Trading Card Game in the recently released Crimson Invasion expansion set. This card allows you to look at your prize cards and swap this card for one of them (shuffle your prizes and place them face down after). Because of the wording on this card, I don’t think you would be able to use Gladion if your prize cards are already facing up. I’m only mentioning this as we now have two ways to do this: Town Map (Breakthrough, 150/162) and Celesteela GX’s (SM67) Blaster GX attack. OK I will totally admit to whiffing on this card. I had it as 27th on my list. I completely missed the value this card brings. Granted, it’s not the greatest Supporter card in the game (if I had a Professor Sycamore (Steam Siege, 114/114) and Gladion in hand at the same time, I’d probably play the Sycamore), but I have frequently played this card, and frequently played it early. I actually had three Sycamores prized in one game, but fortunately I had Gladion in hand turn one and was able to snag one of the Sycamores and use it in my second turn. Another time I had Sycamore in hand but also had a couple of Stage 1’s that I didn’t necessarily want to discard. I played Gladion to grab an energy and continue powering up my Pokemon and saved the Sycamore for the next turn. It’s not a four of by any means, and it might not be for every deck, but it definitely is not a 61st card as I heard on a podcast recently. If you haven’t tried it already, I would highly recommend giving it a shot. Gladion gives you options, and the more options you have, the better chance you will win the match. Our eighth place pick is Gladion (SM: Crimson Invasion 95/111, 95/111), a new Trainer-Supporter that allows you to look at your face-down Prize cards, pick one to add to hand, then shuffles himself into the remaining Prize cards, changing their order and placing them back face down. Lastly, the text states that you must play Gladion from your hand or else he does nothing. Being a Trainer doesn’t mean much in the modern game; how you play a Trainer is determined by whether its an Item, Stadium, or Supporter, and there aren’t a lot of counters or support based on being a Trainer (as opposed to one of the three subcategories of Trainer). As you only get a single Supporter usage per turn, Gladion has to prove itself worth eating up both deck space and a Supporter usage that could go to cards like Guzma, N, Professor Sycamore, etc. The best bit of supporter… er… support is probably VS Seeker, but Gladion can only use that if another card effect puts it in your discard pile, due to its own effect. In some ways, Gladion being unable to be used, except when played from your hand, seems meaningless; this clause exists for the few cards that can copy the effects of Supporters, as it would lead to quite a few ruling headaches otherwise. Breaking down the rest of the effect, seeing your Prizes is useful, but less than it could be as Gladion also makes you shuffle them and place them face down. You should at least have a vague idea of what is Prized as soon as you can use a deck searching effect, and you won’t retain knowledge about which Prize is which like you would with Alph Lithograph (HS: Triumphant FOUR). While Gladion would be stronger if he didn’t shuffle the cards, it is good he places them back face down: Gladion may only be used while your Prizes are face down, so this allows you to make use of Gladion again in the future. It does mean that Here Comes Team Rocket! acts as a counter to Gladion. Gladion inserting himself into your remaining Prizes preserves the Prize count; he’d be pretty broken otherwise! This also means he recycles himself, though you’ve got to re-take him as a Prize, first. As for actually getting a card from your Prizes, its value will vary not only from deck to deck but from game to game. Especially if you already have deduced what is in your Prize cards, there has to be something Prized that you need that is worth your Supporter use for the turn, and wouldn’t be better acquired by the typical approach of focusing on your offense and just taking Prizes rapidly. Even if you need a specific one, we’ve been using Town Map for just that reason for quite a while. Some decks, though, aren’t good at taking Prize cards. They may have a very slow setup or they may be focused on something other than taking Prizes; such a deck may be a control/disruption deck, mill, or even something a little more unusual like bouncing all of your opponent’s Pokémon that are currently in play. I highly recommend Gladion for these decks, in both the Standard and Expanded Formats. He might even have a place in the Unlimited Format; I’m pretty clueless as to its present state, though. Slow decks shouldn’t need more than one or two Gladion; remember, after the first use, he’s one of your Prize cards, so if you don’t get something else, you’ll get him and can just repeat the cycle. Decks that take few or no Prizes may need to run more as they probably won’t have a chance to reclaim used copies of Gladion. For decks in general, though, Gladion strikes me as suboptimal. Not bad, but for him to really work, something you at least “kind of” need must be in your Prizes, you need to be able to spare your Supporter usage for the turn, and a copy of Gladion must be handy. He doesn’t strike me as being worth running heavily in most decks, so that means you need a lucky break with what is probably a single. Unless I’m running a +39 deck with Guzzlord-GX or the like, or I pull more than four Gladion in my booster packs, I’d run him in the Limited Format. Both your deck size and amount of Prizes are lower, but you’re likely to have a lot of cards in low counts and a less reliable deck; you’ll also probably have a Supporter to spare, so even just grabbing a basic Energy from your Prizes might be handy. Gladion is a must run for decks that need access to their Prizes without actually scoring a KO. He is useful for decks that have a slow start and also have enough “moving pieces” that something getting stuck in the Prizes can bring them to a screeching halt. He strikes me as underwhelming for decks in general; while accessing your Prizes without taking a KO is nice, it isn’t so useful that you can often afford to use your Supporter for the turn on it. Gladion earns eighth-place with 24 votings and appearing on five of the six individual reviewer Top 10’s. As a reminder, the ninth-place finisher Guzzlord-GX only managed half as many voting points, and I’ll tell you right now that this is the biggest gap between cards in our Top 10! Gladion was actually my own eighth place pick, so I’m pretty glad that this is where he ended up. Today’s 8th place pick is Gladion, which has some unique effects that I haven’t seen before. He allows you to pick a face-down prize card and put it on your hand. Then put Gladion on the prize card pile face down. Although getting a card from the prizes is great, the fact that you have to pick a prize card face down means that you don’t know what card it’ll be. Town Map and Here Comes Team Rocket would destroy the purpose Gladion is trying to do because all of the prize cards will be face up. Chances of getting the card you know that is in the prize keeps improving the less prize cards you have and assuming your prize cards didn’t get shuffled (does any player shuffle their prize cards?). If you have four prizes left and you used 4 Gladion cards, then you effectively got what you need in your deck or hand and the remaining prizes wouldn’t matter since the rest of the prizes contains just Gladion. This card, due to the wording, when used, he doesn’t go to the discard pile. Also, the last sentence states that if you didn’t play Gladion from your hand, then this card has no effect. I suppose there are very few cases where Supporters can be played somewhere else besides their hand. But all I can think of are old cards like Stormfront Sableye, whose Impersonate wouldn’t work on Gladion, and neither does Smeargle’s Portrait, which only looks at your opponent’s hand and find a supporter there. Overall, Gladion provides a nice trick to solve a problem regarding the cards in your prizes. As for how many Gladion you need to run, that depends on your deck, whether or not the cards you need are crucial to your deck’s success, so much that you deck may collapse if some cards are prized. I had to reread this card and I just realize that I can look at my face down prize cards as opposed to guessing which face down card it would be. This greatly helps consistency. I bumped both Standard and Expanded scores by 0.5 in this case.